The revolution in Germany has come! The masses of the soldiers who for years were driven to slaughter for the sake of capitalistic profits; the masses of workers, who for four years were exploited, crushed, and starved, have revolted. Prussian militarism, that fearful tool of oppression, that scourge of humanity--lies broken on the ground. Its most noticeable representatives, and therewith the most noticeable of those guilty of this war, the Kaiser and the Crown Prince, have fled from the country. Workers' and Soldiers' Councils have been formed everywhere. But we also know that in your countries the proletariat made the most fearful sacrifices of flesh and blood, that it is weary of the dreadful butchery, that the proletarian is now returning to his home, and is finding want and misery there, while fortunes amounting to billions are heaped up in the hands of a few capitalists. He has recognized, and will continue to recognize, that your governments, too, have carried on the war for the sake of the big money bags. And he will further perceive that your governments, when they spoke of "justice and civilization" and of the "protection of small nations," meant capitalist profits as surely as did ours when it talked about the "defence of home"; and that the peace of "justice" and of the "League of Nations" are but a part of the same base brigand that produced the peace of Brest-Litovsk. Here as well as there the same shameless lust for booty, the same desire for oppression, the same determination to exploit to the limit the brutal preponderance of murderous steel. The Imperialism of all countries knows no "understanding," it knows only one right--capital's profits: it knows only one language--the sword: it knows only one method--violence. And if it is now talking in all countries, in yours as well ours, about the "League of Nations," "disarmament," "rights of small nations," "self-determination of the peoples," it is merely using the customary lying phrases of the rulers for the purpose of lulling to sleep the watchfulness of the proletariat. The great criminals of this fearful anarchy, of this unchained chaos--the ruling classes--are not able to control their own creation. The beast of capital that conjured up the hell of the world war is incapable of banishing it, of restoring real order, of insuring bread and work, peace and civilization, justice and liberty, to tortured humanity. 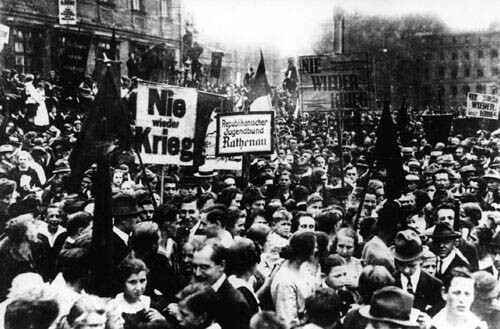 Proletarians of all countries, if we now summon you for a common struggle it is not done for the sake of the German capitalists who, under the label of "German nation," are trying to escape the consequences of their own crimes: it is being done for your sake as well as for ours. Remember that your victorious capitalists stand ready to suppress in blood our revolution, which they fear as they do their own. You yourselves have not become any freer through the "victory," you have only become still more enslaved. If your ruling classes succeed in throttling the proletarian revolution in Germany, and in Russia, then they will turn against you with redoubled violence. Your capitalists hope that victory over us and over revolutionary Russia will give them the power to scourge you with a whip of scorpions. And therefore, we call to you: "Arise for the struggle! Arise for action! The time for empty manifestos, platonic resolutions, and high-sounding words is gone! The hour of action has struck for the International!" We ask you to elect Workers' and Soldiers' Councils everywhere that will seize political power, and together with us, will restore peace. Proletarians of all countries! We call upon you to complete the work of Socialist liberation, to give a human aspect to the disfigured world and to make true those words with which we often greeted each other in the old days and which we sang as we parted: "And the Internationale shall be the human race".